Thurston provided a Man of the Match display in Round 14 to snap North Queensland's horror losing streak, while Inglis was his normal self as Souths beat the Titans in Cairns in the same round. Cronk on the other hand - got a rest against the Knights - so the gap between Cronk and his chasers is just 9 and 10 points respectively. Shaun Johnson gained 2 votes in the Warriors' win over the Roosters in Round 14, but he dropped to 4th on 32 Votes, one ahead of Todd Carney and Adam Reynolds on 31 votes. Sonny Bill Williams is 7th on 30 votes. Reynolds picked up all 8 votes in Round 15 - while team-mate John Sutton (9th) received 4 votes - meaning South Sydney now have FOUR players in the Top 11 Vote getters this season. The 4th is Sam Burgess in 11th with 24 votes. The biggest threat to Inglis is not necessarily the form of Cronk or Thurston - but of Reynolds, Sutton and Burgess - as there just might not be enough votes to go around over the second half of the season. 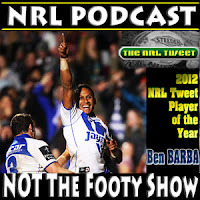 But what about Thurston, Johnson and Carney (with Paul Gallen now hurt again) - will their lack of natural threats to points give them a leg up in the battle to win the 4th Annual #NRLTweetPOTY Award? The current Leaderboard can be found below the Origin 2 Man of the Match Results. Six Voters took part on Wednesday night during QLD's 26-6 win over NSW at Suncorp Stadium: Ben Hoese, Greg Delaney, Matthew Duncan, Nigel Wilbow, Matt Trodden and Warrick Nicolson. Corey Parker received 3 sets of Man of the Match Votes, Johnathan Thurston received 2 MOTM votes and the 'official' Man of the Match - Cameron Smith, received only 1 MOTM vote. GAME 2 VOTES - Follow #OriginMOTM on Gameday for live votes. 5 - C Parker, 3 - J Thurston, 2 - A Fifita, 1 - C Cronk. 5 - C Parker, 3 - J Thurston, 2 - S Thaiday, 1 - C Smith. 5 - J Thurston, 3 - S Thaiday, 2 - M Scott, 1 - G Inglis. 5 - C Parker, 3 - J Thurston, 2 - C Smith, 1 - S Thaiday. 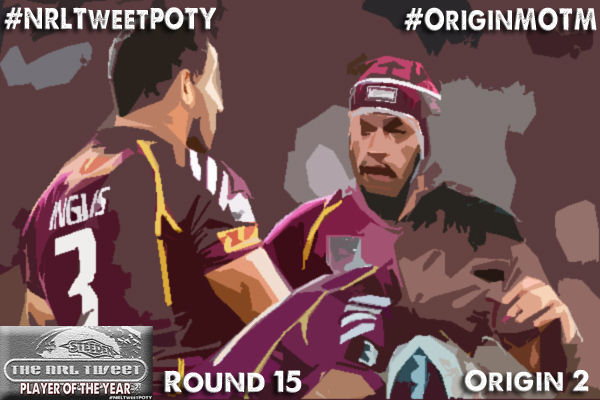 5 - C Smith, 3 - S Thaiday, 2 - A Fifita, 1 - G Inglis. 5 - J Thurston, 3 - C Parker, 2 - M Scott, 1 - C Cronk. Corey Parker now jumps into outright 2nd behind Luke Lewis on the overall voting leaderboard through two games. He has 22 votes (he picked up 4 in Game 1), trailing Lewis on 26 votes (none in Game 2). Johnathan Thurston is 3rd with 19 Votes in Game 2, while Jarryd Hayne (17 Votes) and Robbie Farah (11 Votes) round out the Top 5. The Prestigious Award is under-way for a 4th season in 2013.